Many of you probably already know about the new Mox Opal deck called Slot Machine, a deck that has been worked on by Adam Richardson, Benito Pena Vargas, Zach Sweat, and others. It was featured by Piotr Głogowski, who’s known for his proficiency with combo decks like Ironworks Combo, Lantern Control, and Amulet Titan. He’s also known as kanister on Magic Online and Magic Arena. Shortly after this information was posted, Semblance Anvil and Grinding Station disappeared from the internet. With that said, if you have copies of these cards and don’t plan on playing this deck anytime soon, I would sell into the hype. Yes, the deck might have legs and many Ironworks Combo players might pick up the deck; but these two cards don’t see play anywhere else and can easily be reprinted. Also, they both have only one printing. Since it’s too late to pick these cards up on the cheap, I’d rather think about top-tier cards and decks in Modern that might have a decent matchup against this deck. This deck attacks from different angles, so it’s actually quite difficult to combat. It can mill you out with Grinding Station, burn you out with Pyrite Spellbomb, or attack you to death with Thopter tokens from Sai, Master Thopterist. First, I’d like to start with a list of cards generally found in sideboards that could help with this matchup. Then there are cards that see play in the maindeck. However, since this deck can attack from different angles, there’s no silver bullet. And you can’t just durdle around—you need to put the pressure on fast and have multiple ways to put a wrench in Slot Machine’s plans. Considering that strategy and the various wrenches listed above, a few decks come to mind. I mentioned in article #23 that Humans was most likely on the decline before it actually happened. 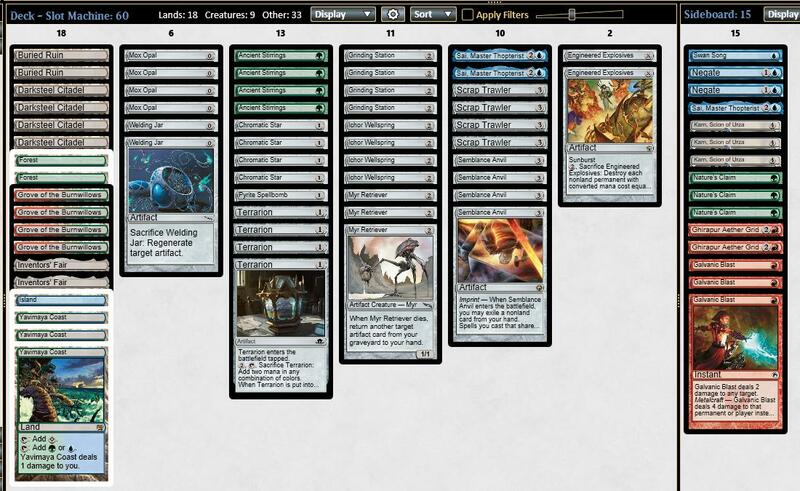 In that article I suggested that you could pretty easily port over to Bant Spirits if you wanted to. But the recent banning of Krark-Clan Ironworks has started to alter the metagame a bit. I don’t know to what extent this effect has contributed to the recent plateauing in popularity of Bant Spirits, but it’s probably non-zero. On the other hand, the rise of various Arclight Phoenix decks has definitely put pressure on Spirits. With that said, it might be time to take a look at Humans again. If you look closely at the manabase, we see a slightly different take on Humans. I’ve been wondering how to rework the mana to take full advantage of Tajic, Legion’s Edge or consistently cast something like Judith, the Scourge Diva. You can also see that MOONGLOW is running a full set of Stony Silences and three Rest in Peace in the sideboard. The mana base still needs work, though—according to Frank Karsten’s mana guide you can’t reliably cast either of the two sideboard cards. At the very least, I would consider playing either a Mana Confluence or City of Brass in place of one Unclaimed Territory. Definitely keep an eye on Deputy of Detention, which I mentioned in article #30. The price of non-foils and foils has started to rise ever so slightly, which makes sense. Take a look at all these decks it already sees play in since its release in January. If you dislike the idea of potentially not being able to reliably cast Stony Silence or Rest in Peace on turn two and still want to run Deputy of Detention, you might want to consider Spirits. But you might have to consider some other options like Surgical Extraction and additional Path to Exiles to have a better chance against Arclight Phoenix decks. Another route you can consider is Golgari a.k.a. The Rock. 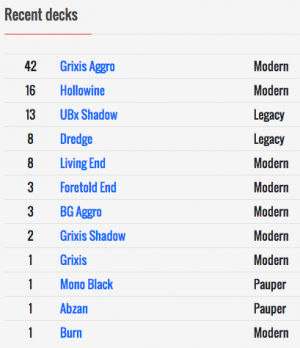 I mentioned Jund in What’s Next #1 as a potential riser after the Krark-Clan Ironworks banning. But it seems like Golgari has been putting up better results. 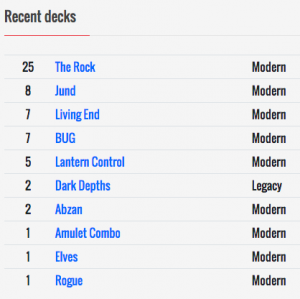 Two decks made the Top 8 at Grand Prix Toronto. The combination of discard spells like Thoughtseize and Inquisition of Kozilek plus the pressure of Tarmogoyf could be a recipe for success against Slot Machine. Tarmogoyf is still pretty cheap compared to its all-time highs, and hasn’t started bouncing back yet. I kind of like the Box Topper version. It’s a steep entry price, but it’ll probably be a while before Wizards comes out with another special version of the iconic card. Note there’s the full set of Fulminator Mages in Lucas’s sideboard, which I mentioned in MTG Metagame Finance #24. Also continue to keep an eye on Assassin’s Trophy, which I mentioned in article #30. This could hit a low of $5, but I think $8 is probably more realistic. Blooming Marsh is probably a solid pickup right now since it just rotated in October and is a Modern staple. And speaking of Tarmogoyf, maybe the better discard-plus-pressure deck is Death’s Shadow. After all, it did win Grand Prix Toronto. Death’s Shadow has already spiked. But I kind of like Street Wraith. It’s already starting to creep back up in price. It sees play in a quite a few decks, and probably won’t be replaced for a very long time, if ever. Other than that, the one card that sticks out to me from the list above is Leyline of Sanctity. It dropped in price recently, which means it might be a good time to pick them up. Bogles can put on a lot of pressure and can be tough to interact with, which might be good against Slot Machine. However, I don’t particularly like it against a field of Thoughtseizes and Inquisition of Kozileks. If Leyline of Sanctity strikes a chord with you, maybe Ad Nauseam is a better choice. I still like the Urborg, Tomb of Yawgmoth Box Topper as a target, which I mentioned in article #27. One word of caution though: be careful with Modern cards. As I mentioned in article #31, we’re not sure yet what’s coming at the end of February. If you don’t know by now, this is one of the reasons I like promo versions of cards when it comes to non-Reserved List stuff, if you tend to hold onto specs longer so you can play with them. Stay up to the minute on what I’m looking at on a daily basis via the MTG Metagame Finance Spreadsheet. Don’t forget to bookmark it, because I update it on the fly. This way you can see what’s going on as the market moves and before articles about certain cards are published. Let me know what you think in the comments below. Agree? Disagree? Why? You can also connect with me on Twitter at @edwardeng. You can also catch me in the Discord channel (edward.eng#4978) if you have an Insider membership. I would go as far to say that this is one of the most valuable things you receive as a member. The Discord channel is very active and real-time discussions revolve around cards that move before anyone sees the actual movement—it’s usually already too late when you see this movement on sites like MTG Stocks, MTG Goldfish, and MTG Price. Hit me up on Twitter at @edwardeng, and I’ll answer any questions you have. I’m also open to suggestions on how to make this series more valuable. Hit me up. That humans deck has enough white sources for Rest in Peace and Stony Silence. 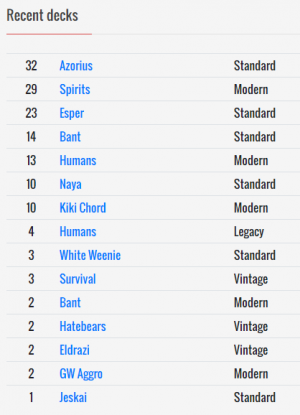 Karsten’s article recommends 13, counting each Noble Hierarch as 0.5 white sources. Using that method, the deck has exactly 13 white sources for Rest in Peace or Stony Silence. The deck should be able to cast those cards on turn 2 about 92% of the time. The pilot removed Ancient Ziggurat and added Gemstone Mine instead so that he would have enough sources for Rest in Peace and Stony Silence. Ya, assuming ur hierarch survives. Im not comfortable with that. But some ppl might b.
That’s why he counts Hierarch as 0.5 white sources, not 1.0. Right. All I’m saying is that I’m not comfortable with that. But maybe others are.